I am an Aeronautical Operations Controller in the UK Aeronautical Rescue Coordination Centre (ARCC). I manage the UK’s search and rescue aircraft (helicopters and aeroplanes) to help anybody in trouble on the coast, at sea and on land. 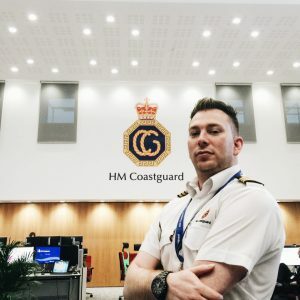 I joined the Maritime & Coastguard Agency as a Maritime Operations Controller. But I have worked in aviation throughout my career, including a number of aeronautical search and rescue roles within the RAF, before I moved to the UK ARCC. Being able to help people by removing them from danger and flying them to safety. Like other emergency services, it’s one of the few jobs where the team and I can make a difference. There are never two days the same. Today we could be called to a sinking vessel and tomorrow we could attend a road traffic collision. We never see what others are describing to us as we work in an operations room, so sometimes it’s difficult to imagine what is happening at an incident, so we rely heavily on good, precise information. The longer it takes for us to get an aircraft there, like a police investigation, the clues start to disappear and the area to search gets bigger. It is advantageous to have aviation qualifications and experience in the industry, but not essential, as you will get training. You also need the right aptitude for search and rescue work, so that you never give up and consider every option in your search and rescue. Technology is all around me. From the most sophisticated communications and search planning tools, to flight planning applications and weather displays, I have what I need at my fingertips. We use technology to join up our coordination sub-stations via a ‘cloud’ and employ backup systems to make sure we can always help those in trouble, no matter what. I have seen buttons change to touch screens and devices that can connect remotely to your computer network. There is a shift in verbal communications to data transfers such as maps, which is better than trying to describe a search area – a picture paints a thousand words. A combination of good academic results and an interest in aviation. You need to be able to operate as part of a team, process limited or unclear information quickly, be able to think logically and, above all, never give up. If you are interested in working within a technology-rich environment where every day you contribute to the saving of lives, then visit us on the Civil Service website.